Help a child with a communication disorder attend CMU Summer Speech-Language Specialty Clinics designed to benefit him or her for life! Clinical sessions are half a day long, with full day sessions available to those ages 7-14. Our current tuition structure for the five week program is $700 for half-day programs and $1,400 for the full day program. 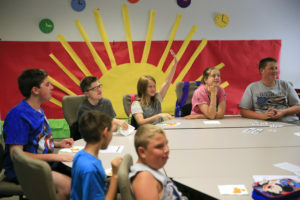 The Summer Speech-Language Specialty Clinics are designed for children and adolescents with communication disorders who benefit from an intensive five-week intervention program. Individuals enrolled in the Summer Specialty Clinics, located in CMU’s Health Professions Building, show favorable outcomes in learning new skills and maintaining skills throughout the summer. The families of the children who come here are enormously grateful for the opportunity – but they need your help to let their children attend. Even sponsoring a half-day camper for one day can make a difference!